Chiropractic care involves a deep understanding of the nervous system, which includes the brain, spinal cord and nerves, as well as the peripheral nervous system. The broad reach of the nervous system on muscles, ligaments and organs allows chiropractic care to promote optimal health. The primary treatment used in chiropractic care is spinal adjustment or manipulation therapy. The understanding of the neurological connection between a disease and a symptom helps to more accurately assess a misalignment or restriction requiring an adjustment. Ready to get your pet started with Veterinary Chiropractic? Give us call today to book an appointment or get more information. A VSMT-certified veterinarian performs a physical examination and a comprehensive health history of the pet to determine a diagnosis and treatment plan. The examination will include observation of the pet’s posture, gait, spinal vertebrae, and extremities. A neurological evaluation may also be included. While the pet is standing, the veterinarian will feel along with spine and muscles for misalignments and provide an adjustment by using a quick, thrusting motion to make a correction. Adjustments are done by hand. Results of chiropractic therapy are often immediately visible with an improvement in gait, posture, and a decrease in pain. Dr. MacDonald is the only veterinarian with VSMT certification from Healing Oasis Wellness Center in the Central Bucks area. He is a graduate of Atlantic Veterinary College, University of Prince Edward Island. Dr. MacDonald has been practicing veterinary medicine in Pennsylvania for 18 years and joined Doylestown Veterinary Hospital & Holistic Pet Care in 2014. In addition to traditional veterinary medicine, Dr. MacDonald blends modern veterinary medicine with the practice of acupuncture, chiropractic and Chinese herbal medication to offer a fully integrative approach to pet healthcare. He also is member of the International Veterinary Acupuncture Society. 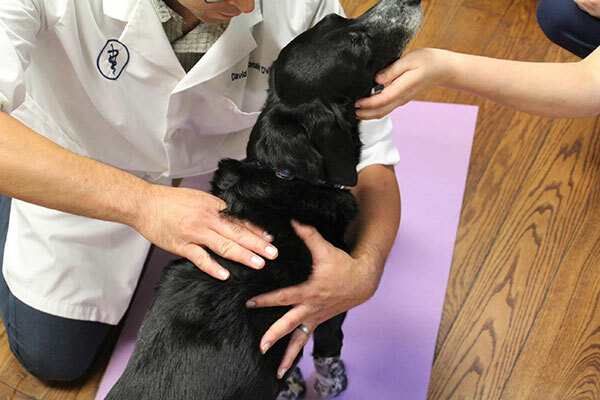 The American Veterinary Medical Association (AVMA) recognizes veterinary chiropractic as a complementary and alternative treatment (CAVM) which also includes acupuncture. Although the treatment of large animals dates back to the early 1900s, veterinary chiropractic as we know it today began to take shape in the late 1980s with the treatment of horses and racing greyhounds. Chiropractic practice has been continually refined since its inception, and today it is recognized as an efficacious evidence-based medicine.